Why use a tie bar or tie clip? There’s nothing more frustrating than your tie moving about, especially if you want to stay looking smart during important meetings. A tie clip or tie bar can be a great accessory to have handy to hold your tie in place throughout the day. Here’s a few reasons to consider purchasing one. Helps make your outfit unique and makes you stand out. A tie bar or clip can be used alongside cuff links and a watch to bring your outfit together. They come in many different styles, colours and sizes. 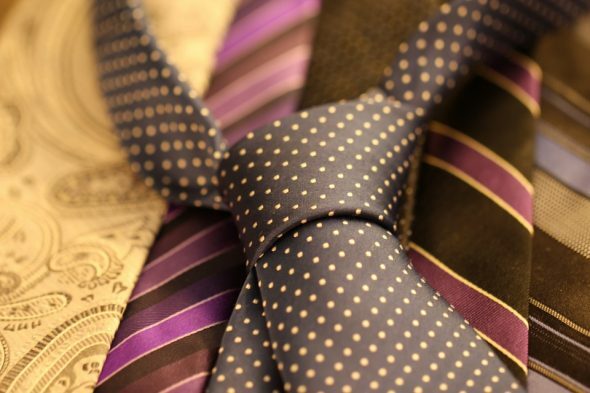 This means you can match different tie clips with different occasions, outfits and ties. A tie bar allows you to secure and keep your tie down to your chest. It helps create weight in your tie and clips to your shirt so that the tie doesn’t wave around and get in your way. Because a tie bar/ clip keeps your tie close to your chest, it means that when you lean over whilst eating or working, your tie will stay secure to your chest and will not drop into any greasy dirt or food. What’s the difference between a tie bar and a tie clip? Clips and Bars do similar things. The only difference is the way they are secured. A tie clip is just that, a clip. It can be opened to secure onto the tie and then clipped into position. The tie bar simply slides on. It is made in a way so that it stays secure without becoming loose or falling off.